Scraps Looking For A New Home! We've been very busy little fabric cutters here, and have once again generated a lot of scraps. I love scraps and have plenty, so I'd like to send three boxes of fabric scraps to a good home! Do you know anyone who would like to adopt a box of scraps? Perhaps YOU would take delivery of one of my loaded boxes of fabric scraps?? Each of the three boxes are filled to the top with various sizes of scraps...all from a variety of my fabric lines with Marcus Fabrics. And you know just how wonderful Marcus Fabrics are!! 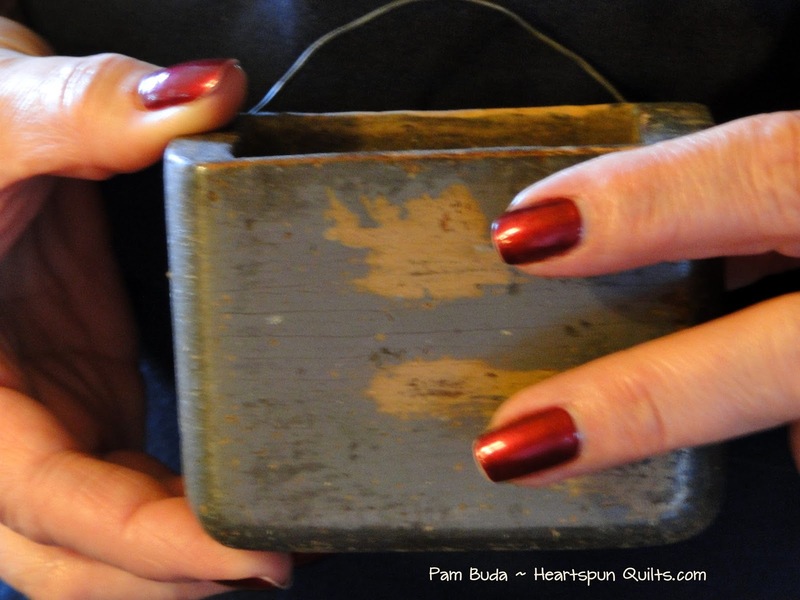 To enter for a chance to win a box of scraps, just leave a comment for me right here on my blog. Tell me what size quilt is your favorite to make. 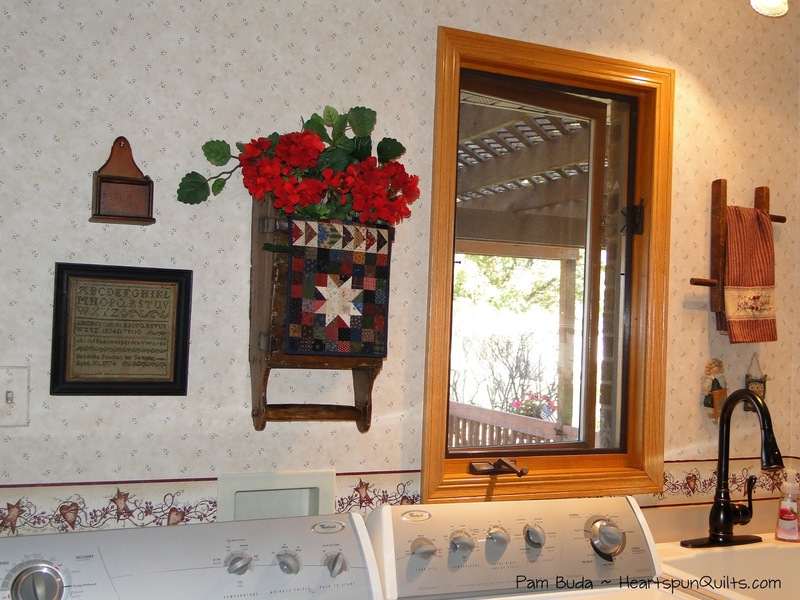 Do you make doll quilts most often? Or, are lap/throw size the quilts you have loads of? Are Queens and Kings at the top of your list? Perhaps tablerunners are what makes you happy!! Thank you all for helping me find a great home to send my scraps. Quilter's are the best people, and so I'm sure they will be well cared for! Teehee!! We gather together once again for our chat about assembling A Prairie Gathering ~ Quilt of the Quarter program. My goodness...it's month eleven and our quilt has really grown! This is an exciting month!! 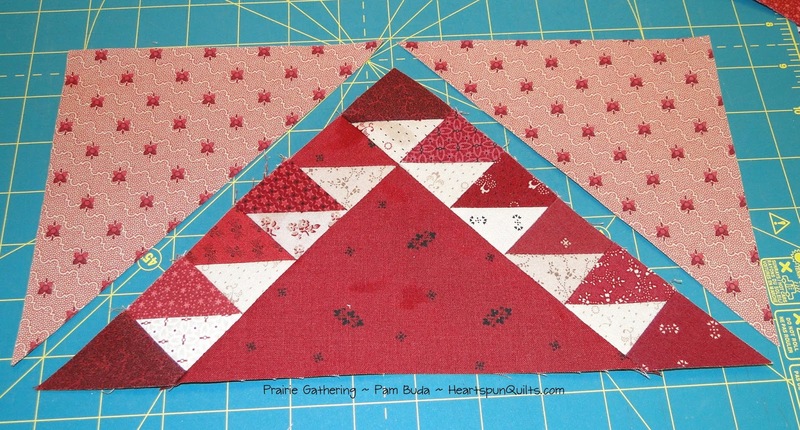 We're assembling and adding the Large Triangle Sawtooth border! In many ways, I really feel this border makes the medallion standout. It's showy and eye-catching without being too difficult to piece. You'll finish making a whole lotta Half Square Triangles for this baby, and then, it's time to put it all together. So...let's begin! You'll choose four assorted HST's and sew them together, making sure they measure what they should. And then choose five assorted HST's, sew and measure. Try to choose nine different print combos if you can. Sew a red triangle to the correct ends of the HST strips. Let the graphics in your pattern be your guide. Carefully, and gently press the red triangles as there's exposed bias there! 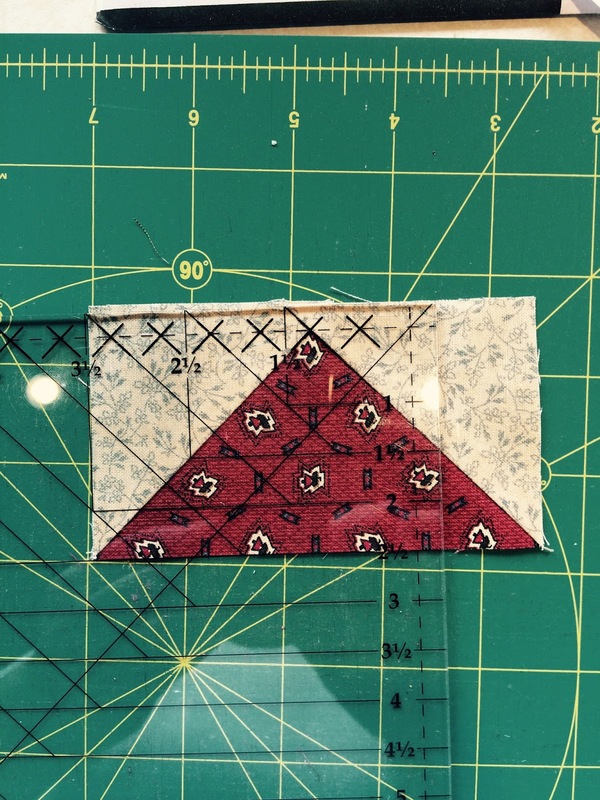 Sew the short strip to the large red triangle first. Be doubly gentle and careful as there's 2 bias edges on this one! Stay away from using steam until the unit is completely sewn!! 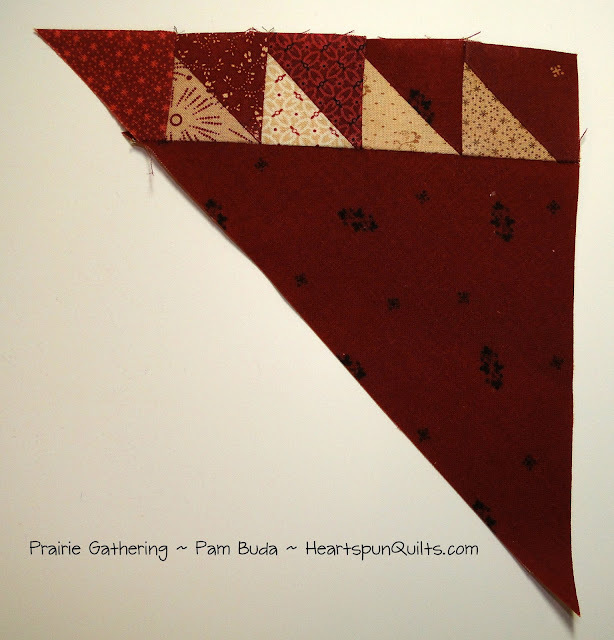 Sew the larger HST strip to the triangle: gently press. That wasn't too bad, right?! 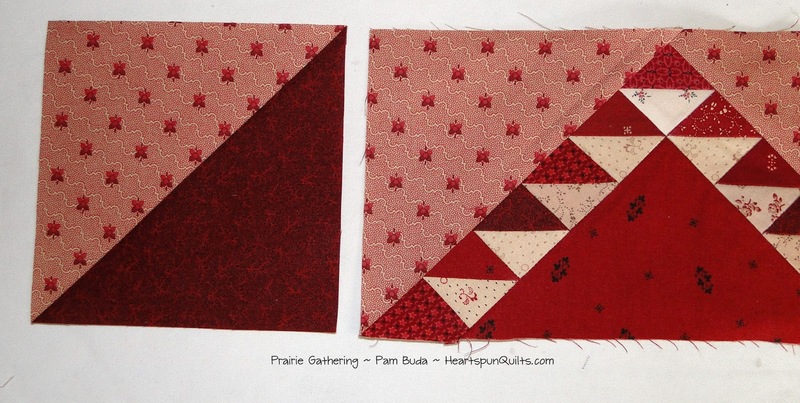 Now you can sew the medium red print triangles to the pieced unit. Again...bias, bias everywhere! Take your time, use those fine patchwork pins that are so wonderful and don't distort your piecing. Sew and gently press. All done! Now you can steam press your block so it lay nice and flat! (You can still see the steam marks in my block - teehee! It was hot off the press!) Before proceeding, make sure the blocks all measure what they should. They sure look good together, don't they?! Follow the instructions in your pattern for piecing the blocks for the borders. 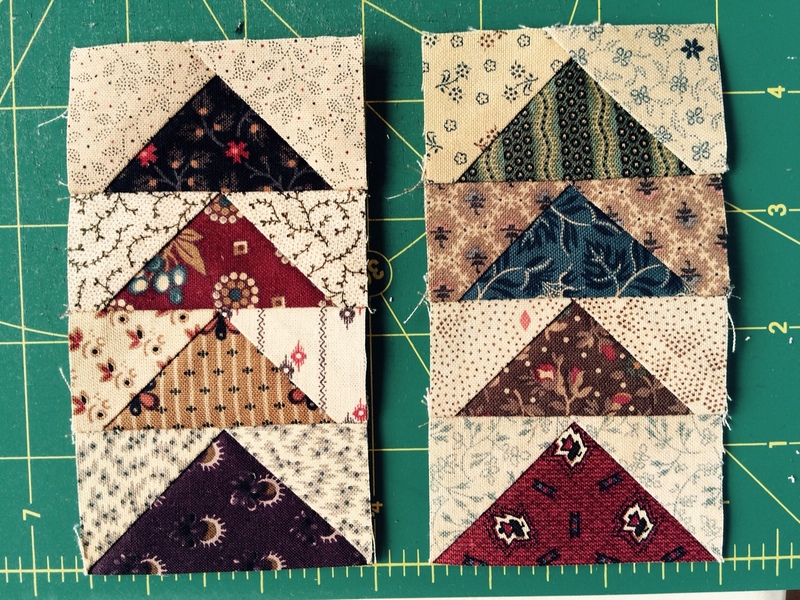 Those top and bottom borders get a large HST, too! Oh, I hope you enjoy piecing your Large Triangle Sawtooth border as much as I did. And, it sure looks wonderful when added to your quilt. 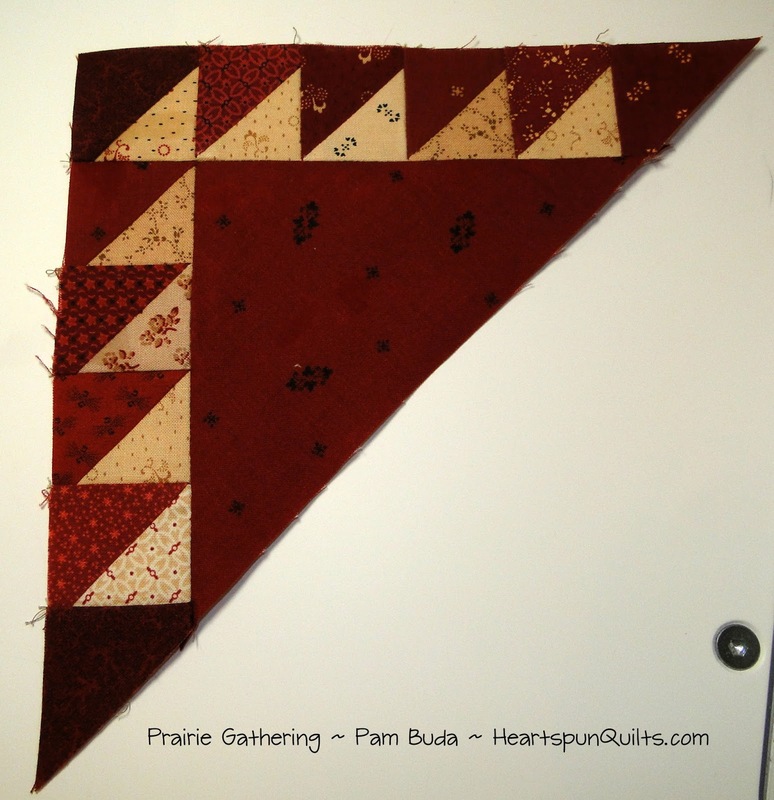 Soon, very soon, your Prairie Gathering quilt will be complete, and you'll have pieced an heirloom in 2015! So very exciting! As we're all preparing to give thanks and spend time with family and friends, I just wanted to give you a gentle reminder to spend a little time piecing your Tucker Sew-Along quilt! I'm collecting more and more photos of Tuckers made around the world everyday, and I don't want to miss yours!! Please email your Tucker photo to Pam@HeartspunQuilts.com (as an attachment, please!) by December 15th. Also, watch my next post for another fabric scrap give-away! We've been busy cutting and making all kinds of new things, and once again, I have so many more fabric scraps that I just can't use!! Several boxes full will be sent to good homes!!! 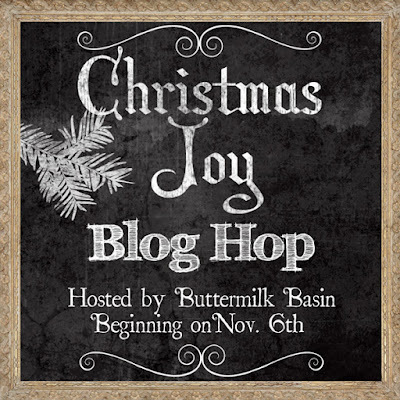 Welcome one and all to my day of Buttermilk Basin's Christmas Joy Blog Hop! I'm so glad you came for a little visit!! As the days are shorter, and the temperatures are getting colder, you can feel the Holidays in the air! Thanksgiving is just a few days away, and after we take time to count our blessings, Christmas preparations will be in full force! 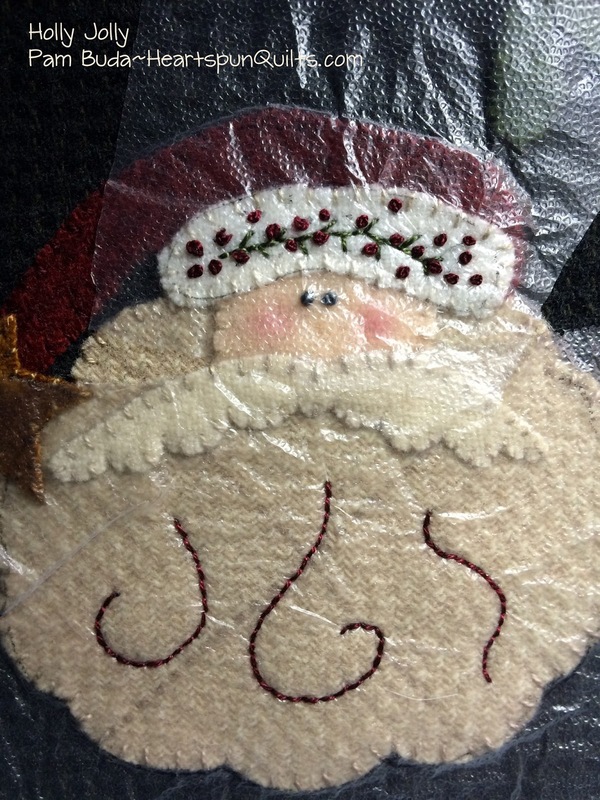 We've all created projects for your stitching pleasure to ring in the cheer! Here's my gift to you this holiday season. 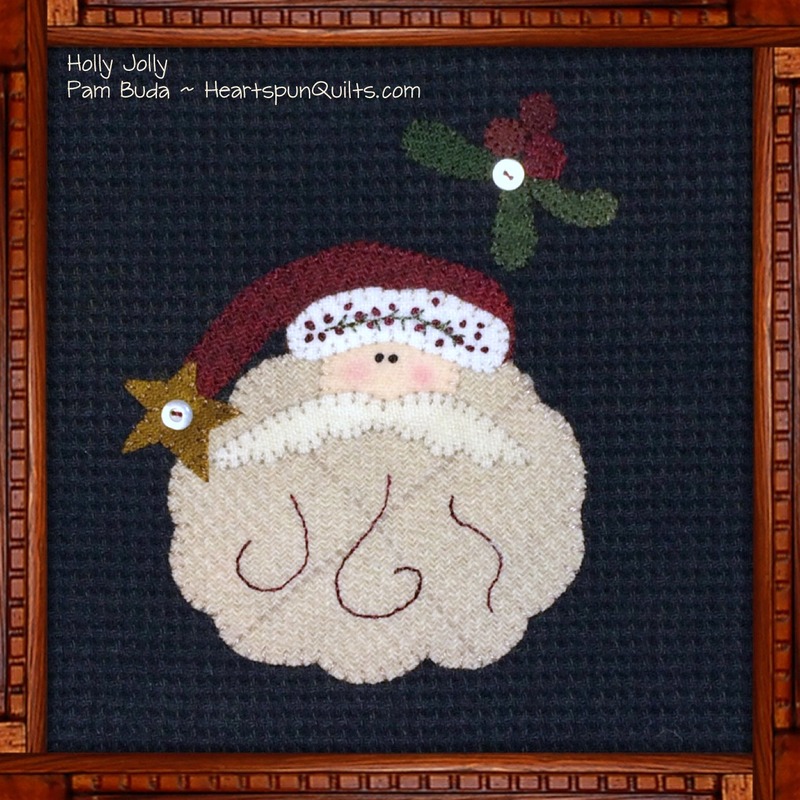 With a sprig of holly & berries, my Holly Jolly Santa is a pretty quick stitch. It would be very easy to make a bunch for hand-made gifts this season! And...there's just nothing better than that. Construction is pretty straight forward with the exception of the stitching I added in his beard and hat brim. (Back to that in a moment.) You might notice that I use a whip stitch instead of blanket stitch. For reasons I really don't understand myself, I don't enjoy blanket stitching, and I truly have a love of the needle and just about all stitches, but just don't care for it. So....I gave myself permission a while ago to do a whip stitch instead, and am very pleased with the results. Last year, I learned a really cool technique from my pal, Kathy Cardiff (of Cottage at Cardiff Farms) that I love for adding top stitches to pieces like this. Allow me to repeat what Kathy taught us all last year on the blog hop. 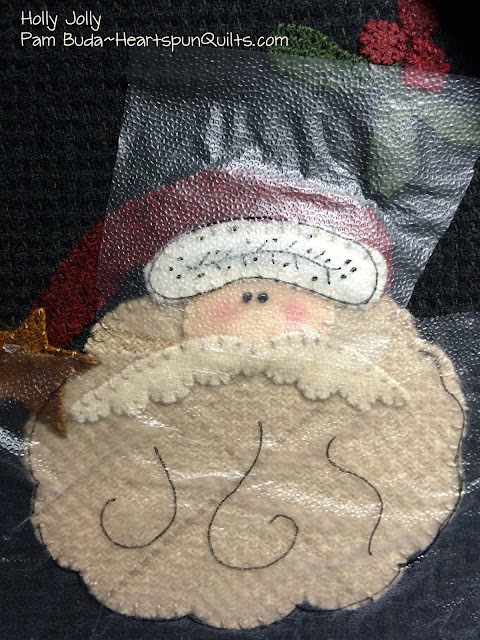 After all my whip stitches were done, I traced the stem and berries, and Santa's beard wisps, onto Glad Press 'N Seal with a fine point Sharpie marker. Allow to thoroughly dry. Press onto the wool where you want to stitch, and stitch right through the plastic wrap! All the stitches are right where I wanted them to be! Then, carefully tear away the plastic wrap. Perfect! Easy!! Love this technique! Thanks, Kathy for sharing this with us all. Click here for a downloadable, printable pattern. True confession time....I've have not had the time I really wanted to properly finish my Holly Jolly, and so I Photo Shopped a frame around him for now. Next week, I'll be able to finish him the way I really want to, and I'll share photos once he's all done. You can make him into a pillow, pinkeep or frame him...whatever you'd like! What will you do with your Holly Jolly?? The recipe I chose to share is Bacon Stuffed Mushrooms. This new family favorite was discovered by my daughter, Nicki, and is absolutely delish!! It's easy,and wonderful, and gone in a hot second, and we are always asked to share the recipe. I hope you enjoy it sometime during your many holiday get-togethers! I also promised to pick a winner for a Fat Eighth bundle from my fabric collections (Marcus Fabrics) from all of the comments I received about my FREE Pocket Patchwork Sew-along called Tucker. I love Tucker and can see how leaving the batting out would work well for some displays. I have a box full of 1 1/2" pieces just ready for a project like this. Congratulations, Ruth! 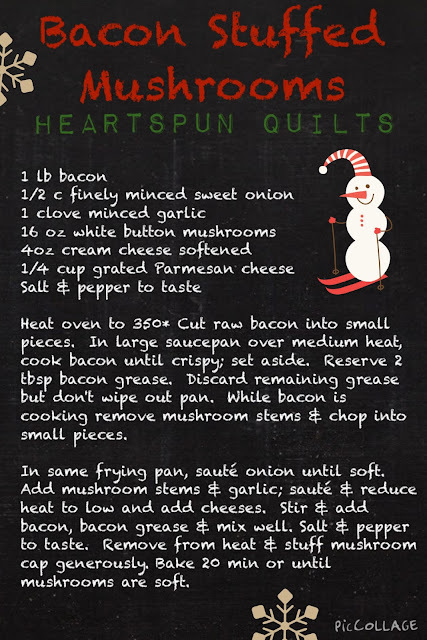 Please email me at Pam@HeartspunQuilts.com, and I'll have your bundle on its way to you mucho pronto. 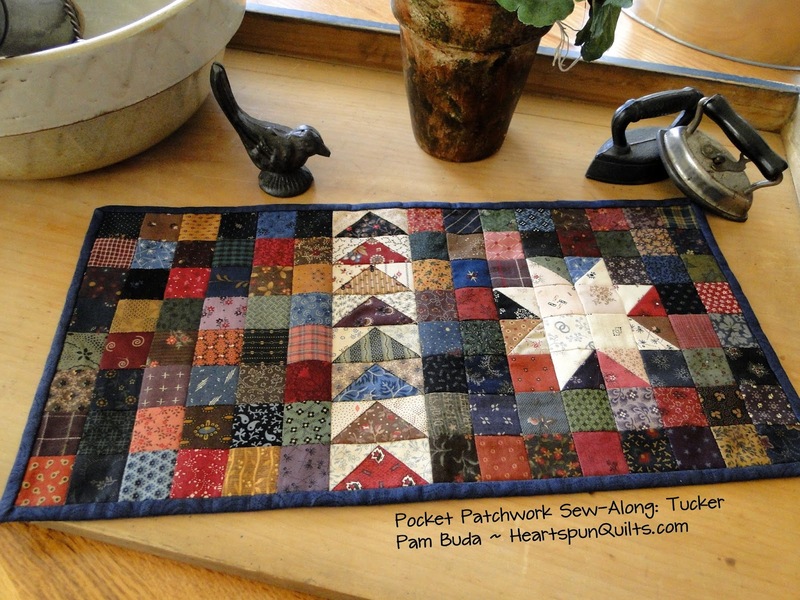 If you'd like to know more about my FREE Pocket Patchwork Sew-Along, Tucker, click here. Thanks so much for visiting me today, and I wish you and your family a wonderful Thanksgiving, and blessed holiday season. Are you getting in the mood for Christmas yet?? Whether you are or aren't quite there yet, we have some great fun going on right now to bring J*O*Y to your holidays! Here's the line-up of talented designers who have created a special project just for this occasion. Click here to see the projects that have already been revealed. You know the projects will be really great, and there's a new recipe posted each day as well to enjoy over Thanksgiving, Christmas or any special day. Enjoy, and see you back here on November 14th when it's my day!! I know you're all anxious to meet Tucker, and I'm betting you're going to quickly scroll down to see what the finished results looks like, and I can't say I blame you. I'd likely do the same. Now that you've had a first look....are you scratching your head? Are you thinking....'this is the path she lead us down?' Well....as I said from the beginning, Tucker wasn't to be my typical quilt design, but.....it was most definitely designed with a distinct purpose in mind! I hope you'll keep an open mind as we finish Tucker, and I explain the method to my non-madness! From the pieces you have left, you'll be making (8) Flying Geese units. To construct them, draw a diagonal line on the wrong side of all light print squares. Position a light print square on the left side of a dark print rectangle. Sew just inside the drawn line, and press, checking the accuracy and placement of the light print triangle. Then, trim a quarter inch seam allowance from the center and bottom fabrics. Repeat on the right side. Make (8) Flying Geese units measuring 1 1/2" x 2 1/2" unfinished. I used (8) Flying Geese units I had lying around. Orphans, if you will. I love, love, love this ruler! 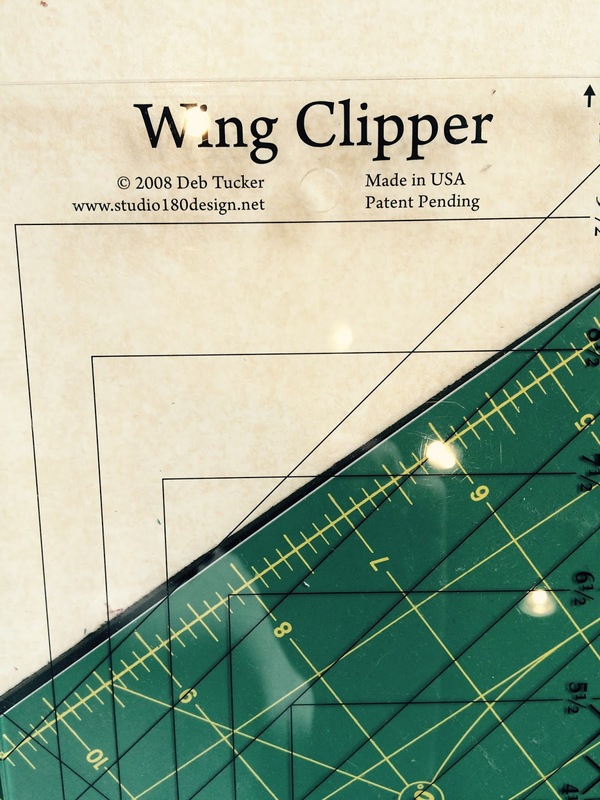 You can create Flying Geese units in sizes from 1 1/2" to 10 1/2" with this ruler, and trim them to perfection each and every time!! Obviously, it also works to trim larger,m orphaned FG to any smaller size like I did. Notice the ruler's 2 1/2" vertical line on the left side light print, and where the line turns the corner, it travels horizontally to meet the seam allowance for the right side light print. That shows your first cut. Notice, also, that there is extra fabric above the pink goose point. I trimmed that as well. After trimming the first two sides, you rotate the FG unit, and trim the last two sides. Absolutely perfect results every time. You can't beat that! Click here to read more about this ruler, and order one if you're interested. Here are all my trimmed Flying Geese. Now sew them into (4) sets of pairs. Each pair should measure 2 1/2" x 2 1/2" unfinished. 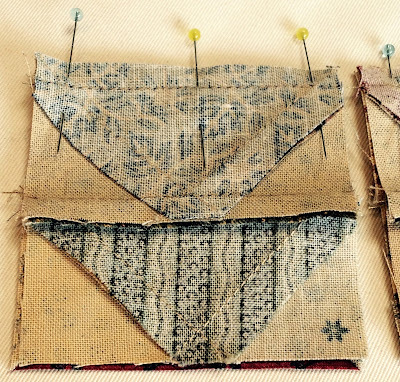 Sew your pairs together to make (2) foursomes. With small pieces like these are, the size of your pins is more important than ever!! Thicker pins will distort your patchwork, and while thick pins are no good no matter what size unit you're making, the smaller the pieces, the more impact thick pins will have. I love these fine patchwork pins and wouldn't use anything else!! If you'd like to know more about them, click here. Your foursomes should measure 2 1/2" x 4 1/2" unfinished. 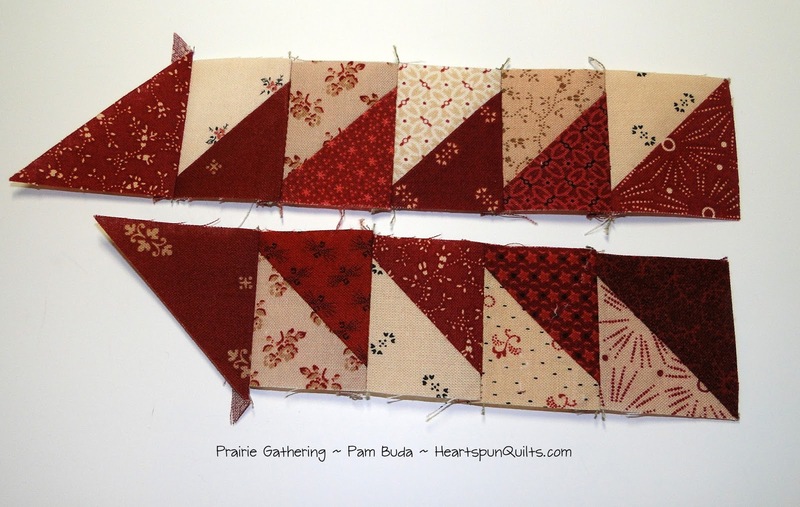 Sew the (2) foursomes together for one long Flying Geese strip measuring 2 1/2" X 8 1/2" unfinished. Sew the Flying Geese strip to the top of the star block; press. Quilt should measure 8 1/2" x 10 1/2" unfinished. 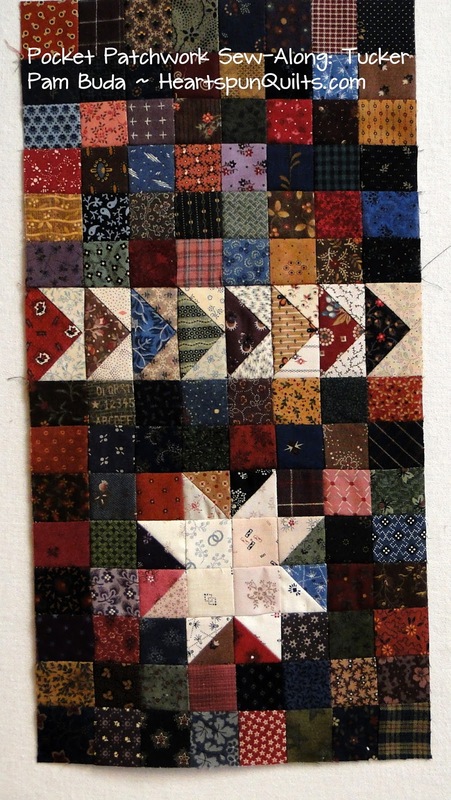 Sew the remaining patchwork block to the Flying Geese strip; press. Your little quilt should measure 8 1/2" x 16 1/2" unfinished. This is how my sweet, little Tucker turned out. In finishing my Tucker quilt, I did not use batting, and did not quilt it in any way. This was quite deliberate on my part as you'll see why shortly. I just chose a backing print, and basted the top and back with big stitches. Nice and easy! I cut (2) 2" x WOF strips for double fold binding. I normally cut my binding strips at 2 1/4", but because I didn't use batting, I didn't need the extra width. So, keep that in mind when deciding the width of your binding. You can certainly add batting and quilt yours if you prefer, but before you make that decision, read on. Now that Tucker is done, it's time to show and tell you why I've named it Tucker. 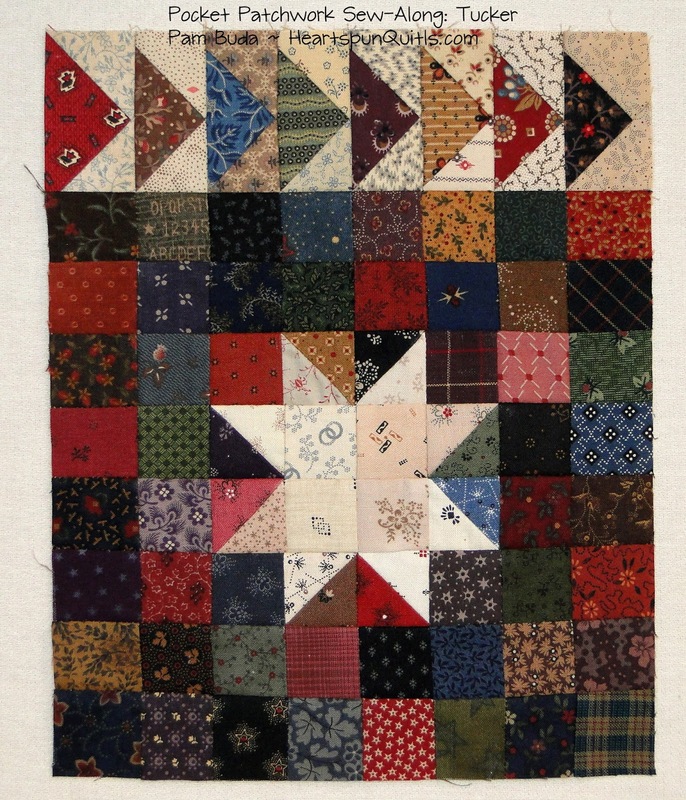 You may remember in my first post, that I said Tucker wasn't going to be my usual quilt design, and that I had been inspired my Mary Campbell Ghormley's vintage doll quilt collection at the International Quilt Study Museum in Lincoln, NE. 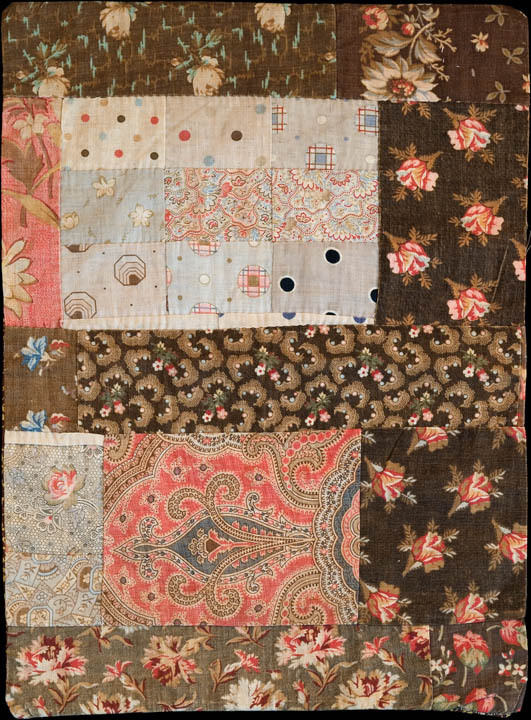 A lot of the nineteenth century quilts collected by Mary don't have a block pattern or ordered design to them. They were likely made of units, blocks and scraps the quiltmaker had laying around. That didn't mean they were any less wonderful, and are certainly treasured now, not to mention are presently living in a museum! If you're a regular reader to this blog, you know how much I love early American history. 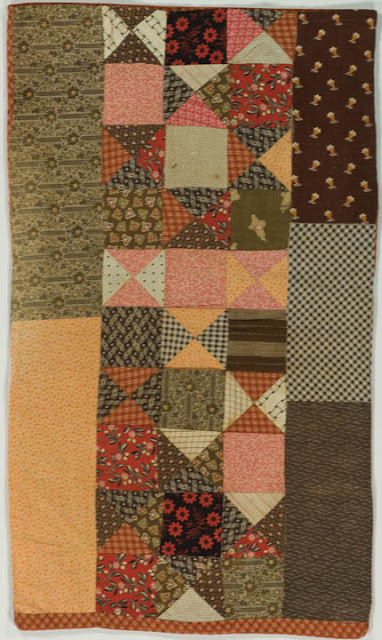 These quilts touched me deeply as I imagined our quilting ancestors sewing the patches together for a child's doll. No batting, no quilting, just love stitched for a little girl's happiness. (Of course many had batting and quilting.) Their living situation meant they had to be frugal, and wasted nothing. 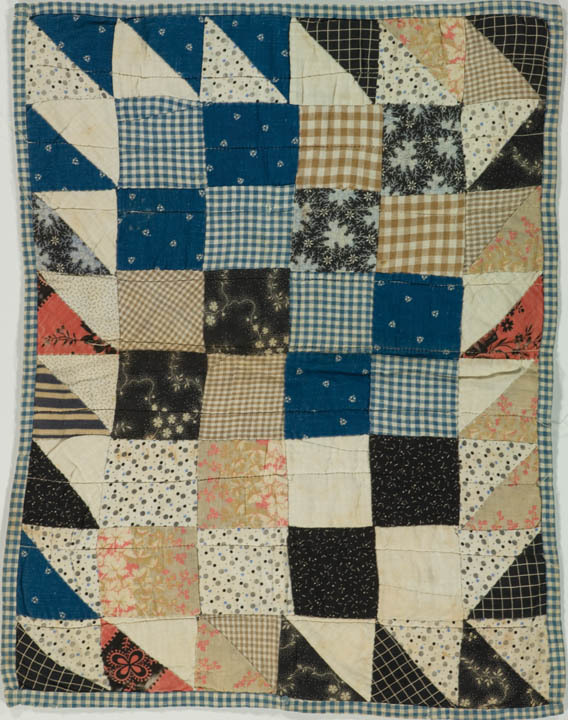 Did they have any idea how charming these quilts would be to us? Inspiration struck with a solution to a desire I had been ruminating over for many months!! 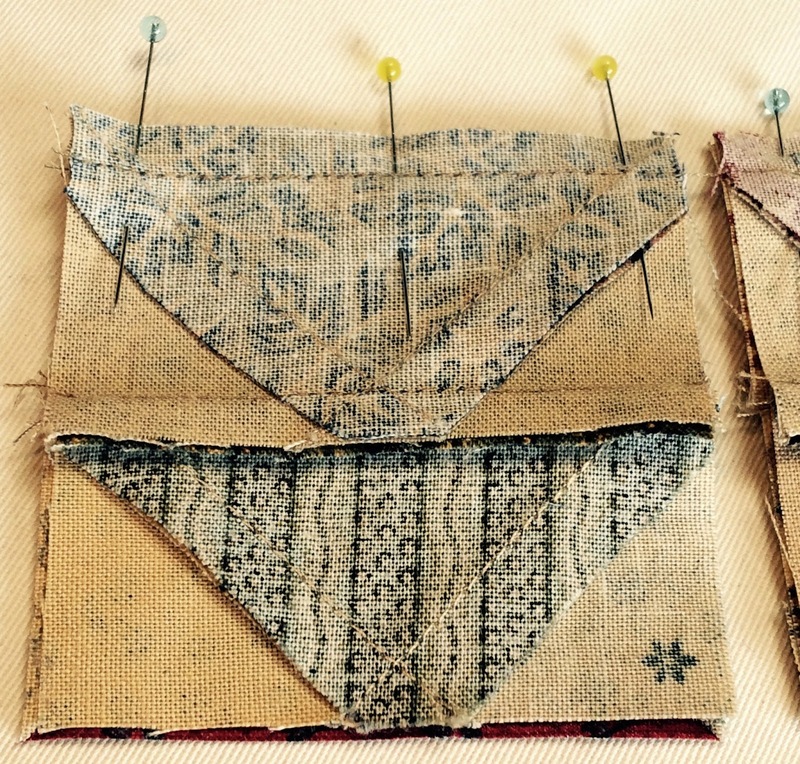 I've been wanting to make a bunch of little quilts that I could tuck into several places here and there in my home. Nothing fancy, not a lot of work, but pleasing and interesting, of course. 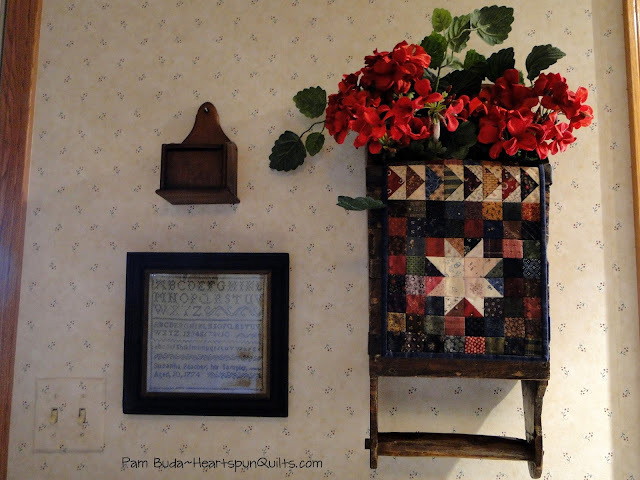 Why it took visiting the International Quilt Museum and Mary's collection to spark the inspiration, I don't know? I've learned not to question why, but to follow my instinct. Having a little "tucker" quilt inside a Furkin was one place I had wanted one, and the missing batting helps with fitting the lid. For a utilitarian quilt like this, batting and quilting is just not necessary. What do you think? Will you miss the quilting stitches when you look at it, or just enjoy it the way it is? For some of these little cuties, I know I won't miss them. But, if you would, you should! This is where Tucker will live in my house. It's my lowly laundry room. You know how much time we spend in there! It's also a mud room for us, so we're in here all the time, entering from the garage and back yard, etc. I want this little room to be a happy place, so I've decorated it to be just that. It needed a quilt! Tucker is tucked into an old feed/grain scoop. 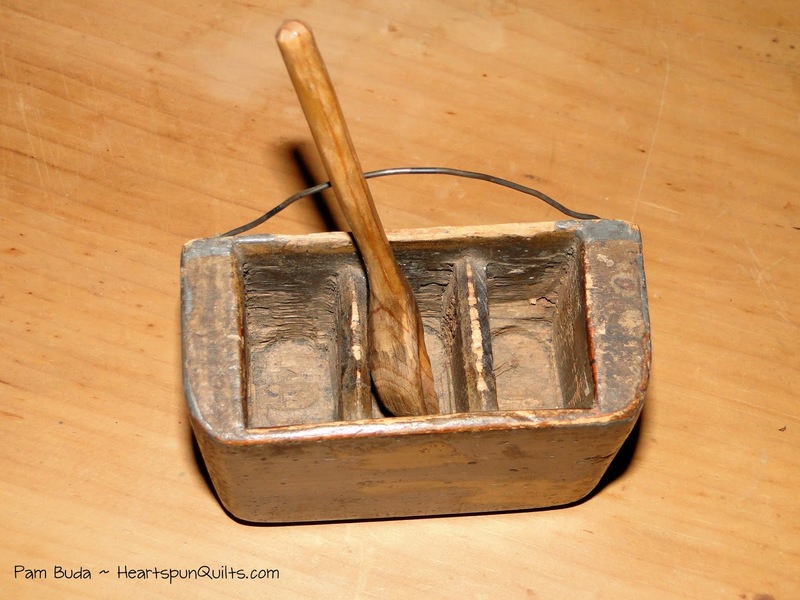 This handmade treenware tool has been with me for many years, and I love it. The flowers are inside the compartment where all the feed/grain would have been collected. There is another handle that the quilt is covering. It has a lot of character, and no doubt spent many years in service to its owner. What stories it could tell...if it only could! It was the perfect place for a little quilt, but it had to be small and thin, or I thought it might overwhelm the scoop. Like you, I don't have a lot of time to piece all the things I want to make, but studying Mary's quilts made me realize that I could use orphans units and patchwork squares I already had laying around, and create something lovely without a lot of fuss. About the "tucked" part of Tucker....if I only had me to think about, I would have used more orphan units/blocks, such as Half and Quarter Square Triangles, Nine Patch blocks, etc., just like in Mary's quilts shown above, but, that would have meant more piecing for you if you didn't have the same blocks. I felt I was already taking a risk inviting you on this unusual piecing journey, so I asked you to just use your scraps, hopefully spending no money, and not too much of your valuable time. The tucked part of the quilt won't be seen, so you might wonder, why piece anything at all? Why not just use plain fabric? Good question, and you certainly can, but.....I really wanted to do as our quilting ancestors would have, and I'm so glad I did. I thought they would not have wasted a large piece of fabric on something that wouldn't be seen, and would have chosen to pieced random scraps for the job instead. That's how I imagine it, anyway. By now, you know why I named this sew-along Tucker. Hope it makes you smile! My next Tucker quilt will likely use a large orphan block leftover from another quilt project. Isn't that a great use of a large, leftover orphan block? In case you're not loving my Tucker idea, please know that I am sorry. I tried to forewarn everyone from the beginning that it would not be my typical sew-along, and to prepare you. 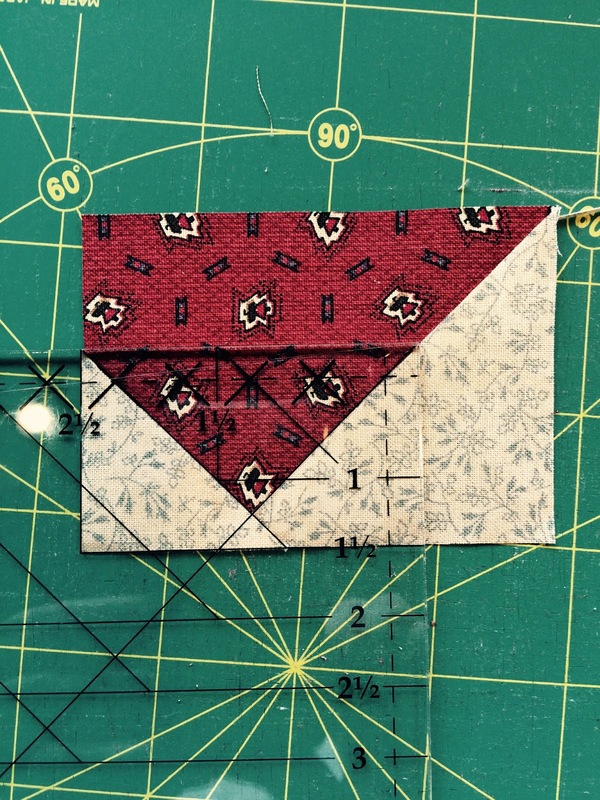 If you have cut and sewn your scraps thus far, all is not lost! 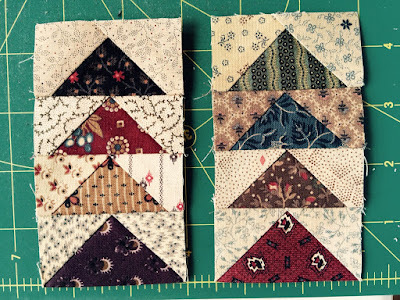 With a little un-sewing of your patchwork squares, you can add to them to make another star block, and create a little table runner. I hope that eases your disappointment!! My apologies for the unusually long blog post, but I had a story to tell you! 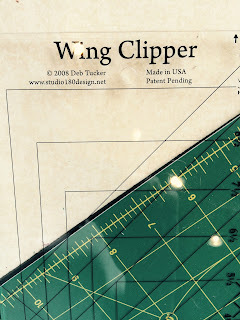 I would really, really love to know what you think about Tucker quilts. Yes, it's a term I've coined and hope it will continue. I'd love it if you'd leave me a comment with your feedback, I will choose one winner to receive a Fat Eighth bundle of one of my fabric collections. And, I most definitely want to hear all comments...favorable, and non-favorable. I'll choose a winner November 14th. I've also added a little poll to the side-bar of my blog, so click here to cast your vote in the poll. It will be fun to see what you all think! I'd also love for you to post your Tucker quilt using #TuckerQuilts on social media! It has been my pleasure to take this Journey with you all, and I thank you so much for sewing along with me once again! I appreciate all your comments, your emails, and your business, and hope to be able to continue sharing things with you for a long time! Now...it's my turn to wait to see what you think and what your Tucker Quilt looks like! I've received quite a few emails inquiring about the mention of a Spill Keeper in my profile article of American Patchwork & Quilting magazine (Dec, 2015). In the 'What Is Treenware' inset (pg 20), the writer gave a few clues as to its purpose, but because of space, a photo was not included. 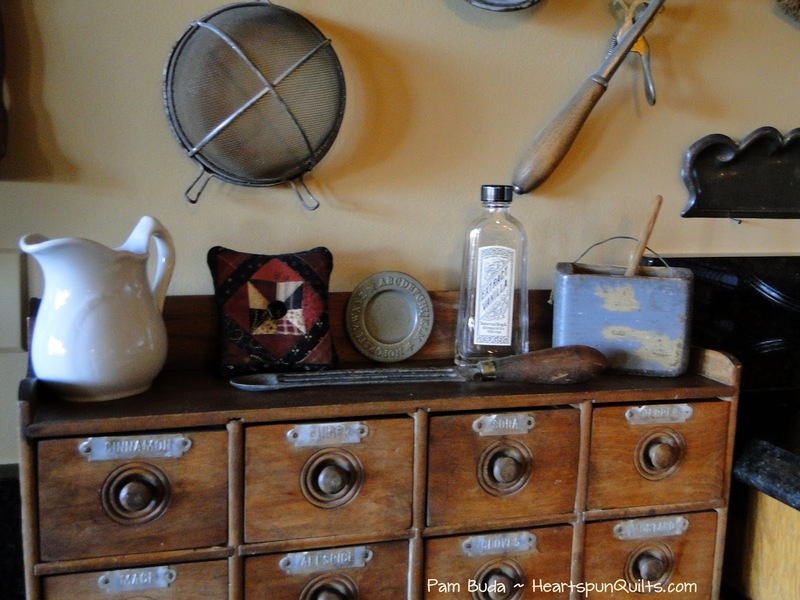 My Spill Keeper sits atop one of my favorite antique finds, the horizontal spice box, and is the little blue box at the far right. In this close-up, you can see it a little better. It's about the size of a deck of cards. 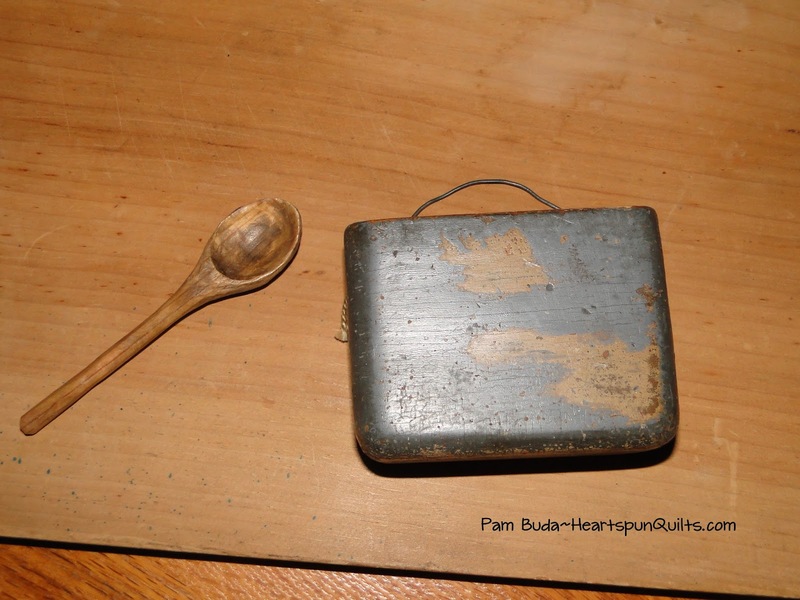 This dear piece of carved treenware has three compartments, and a hand carved little spoon. Pioneers would save little bits of flammable scraps and materials of any kind, such as threads and fabric, lint and leaves that could be used in starting a fire. The bits would be placed in one of the compartments, and the spoon would crush and compact the bits. When holding the Spill Keeper as our pioneering ancestors would, you can see how the blue paint has been worn away from two grasping fingers, giving it a little more character, in my humble opinion. Why it's called a Spill Keeper I don't know. It's likely a term lost to the past, just as the need for a one is. It remains an artifact of nineteenth century living, and yet another tangible relic of their frugal lifestyle. We are so spoiled and blessed in many ways. I think, though, maybe they would look at us with our many conveniences and think, perhaps, that life is way too fast in the twenty-first century...so, no thanks..... they'll keep their simpler way of life. Fun to ponder, isn't it?! 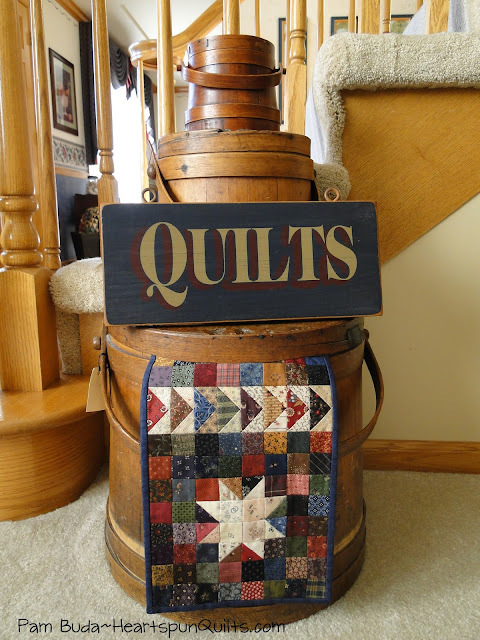 This photo was sent to me by Angie Roberts, shop owner of The Noble Quilter in Elk River, MN. These lovely ladies are some of the women in the shop's Prairie Women's Sewing Circle club. As you can see by the wonderful display of quilts before them, they are quite an active group!! Awesome job, my fellow Prairie Women!! Your quilts are just lovely!! Thanks, everyone, for sharing your talents with us.